Faculty staff and students get their parcels at a make-shift collecting point in an indoor tennis court at Nanjing University of Aeronautics and Astronautics (NUAA) in Nanjing, east China's Jiangsu Province, Nov. 13, 2018. China witnesses a surge of express delivery parcels around the Nov. 11 online shopping spree. During the Nov 11 Singles Day sales festival, the e-commerce store operated by Britain's Royal Mail receives tens of thousands of orders a day through its e-commerce store on Tmall Global, the international brands platform of China's e-commerce giant Alibaba. This past Singles' Day in China confirmed the country's standing as a growing consumer market and increasingly open economy, said Argentine economist Jorge Marchini. More than a week before Nov. 11, the date of China's annual shopping bonanza, Peking University student Zhang Weijia added several items to his cart on Tmall, Alibaba's online marketplace, and could barely wait to place his orders with deep discounts exclusively released on Sunday, known as Singles Day or Double Eleven. 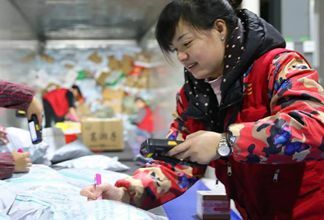 Staff members work at the distribution center of Hengyang branch of China Post in Hengyang City, central China's Hunan Province. Smashing over 10 billion yuan in just two minutes and numerous international brands selling out in a flash, China's online shoppers have redefined the worldwide shopping binge in numbers as Alibaba's Single's Day entered into its 10th year. On the back of strong consumer spending in China, Alibaba has reported record Singles' Day sales, which is good news for overseas sellers who recently joined the shopping festival. Overseas retailers racked up big sales on Alibaba’s Singles Day shopping festival. The e-commerce giant said 3,700 categories representing 180,000 overseas brands from 75 countries and regions were featured during the shopping extravaganza. Alibaba achieved record high sales of 213.5 billion yuan ($30.7 billion) during its annual shopping spree on Nov 11, which was also the 10th anniversary of its global shopping festival. China's e-commerce giant Alibaba Monday said the Singles' Day sales on its online shopping platforms reached a record 213.5 billion yuan (30.7 billion U.S. dollars). 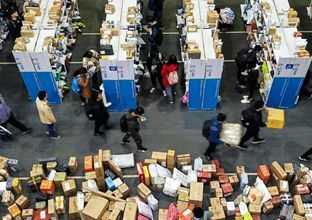 Major e-commerce giants received 1.35 billion delivery orders, a 25.12 percent rise, on Nov 11, or Singles Day, a Black Friday-like shopping festival in China, according to the State Post Bureau. Delivery companies were running at full speed to deliver massive number of parcels after Alibaba Group's Singles' Day online shopping spree on Nov. 11.